It had to be a compliment, I decided. Who couldn’t help but admire the van for its robust frame and its classy cabernet sauvignon veneer? Or perhaps he wished he knew how it felt to rev the 10-mile-a-gallon, fuel-funneling beast that lurked under its hood. Because his entourage responded to the question with uproarious laughter, I quickly gathered that he wasn’t lavishing my van with praise, but taking a cheap shot at it with some lewd 80’s pop-culture reference. I later did a little researching on the A-Team. 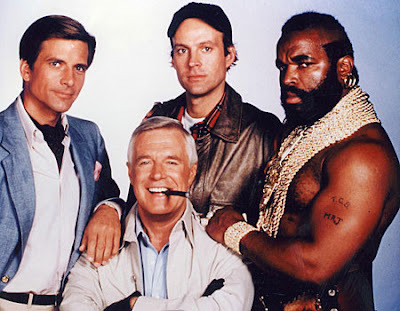 Apparently, the A-Team was a hit 80’s TV show starring Mr. T who played B.A. Baracus. He and three other ex-commandoes worked as hired mercenaries to fight crime. 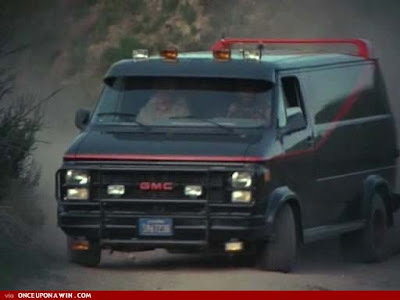 They also had a giant, creepy-looking van like mine, which performed dazzling stunts on their missions. I wish I had known all this before. Just imagine how scared shitless he would have been if I had responded--in my best Mr. T impression--"Quit your jibba jabba, sucka!" Living in the van is sometimes a bit like being invisible. Because it’s unfathomable that somebody’s actually inside, passersby walk and talk past my bedroom window without a second thought. For the most part, I have as much privacy as I need. But I do overhear the occasional comment. One guy walking with his girlfriend said, “I want this van. It looks like a mushroom.” On a Saturday night some drunk stumbled face-first into the rear of my van. In another, more poignant case, a girl who was just dumped cried her eyes out on the curb next to me while her very faithful friend comforted her by ridiculing her ex. Yet, unbeknownst to them, there’s a living being right next to them, listening in on their conversations. But I suppose it goes both ways. Perhaps others ambling past my van have heard a strange rattling of dinner pans or some midnight snores. I suppose the moral of the story is: watch what you say when you cross a creepy looking van. You never know who's inside. You didn't know what the A-Team was? Not too surprised, but still. that's fucked up u didnt know what the A-Team was....i'm gonna take a quote from quaz, "you think you know somebody..."